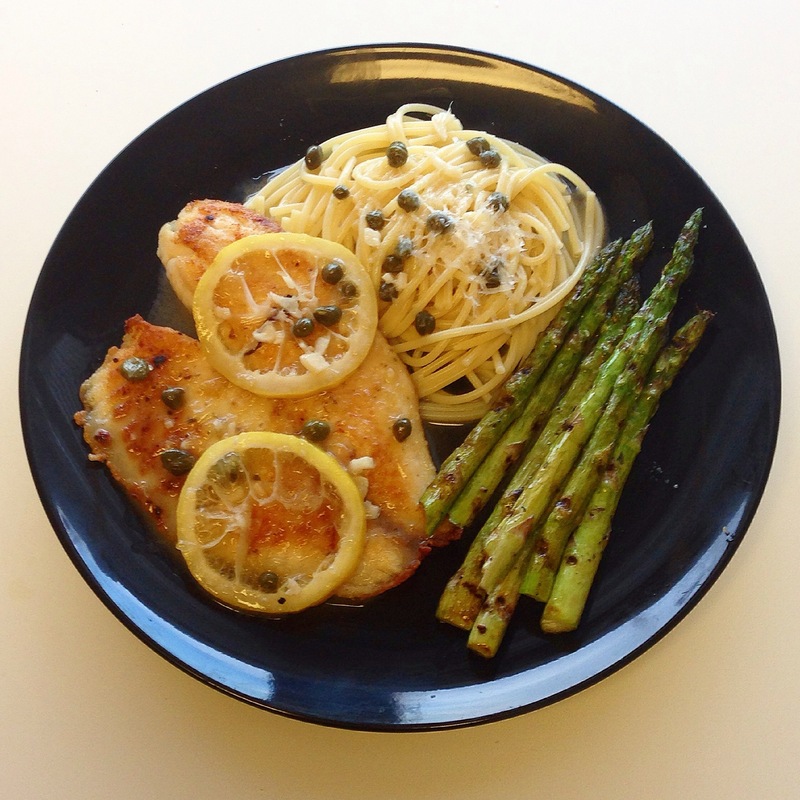 When Life Gives You Lemons…: Tilapia Piccata with Grilled Asparagus – Pao Says, "Open Wide!" First, I seasoned my *room temperature* tilapia filets with some salt, garlic powder, and tossed them in flour (light coat- this helps them crisp up when you fry them). I set them aside for a few minutes while I prepared my sauce ingredients: 1 large clove chopped garlic, 1 tbsp butter, about 1 tbsp capers, the juice of half a lemon (a little less than a tbsp) plus a few thin slices of the lemon, 3/4 cup white wine, and about 1/4 cup chicken stock mixed with a teaspoon of flour (this will serve as your thickener). Once I have my sauce ingredients ready, I fry up the tilapia filets in some olive oil over med-high heat. As soon as they’re done and have a nice golden color to them, I set them aside on a plate and add the butter, garlic and capers along with the thin lemon slices. Let this cook up a bit until you start seeing the garlic begin to turn slightly golden. Add the lemon juice, wine, and chicken stock mixed with flour and stir well to combine everything. The sauce will thicken over the next 3-5 minutes as it reduces. Once you see the sauce start coming together and becoming opaque, take it off the heat and start pouring it over your tilapia (and pasta) to serve! This is going to sound too easy to be true, but all I did was toss the asparagus in olive oil and garlic salt… Then I grilled them on my cast iron grill pan for about 5-7 minutes, making sure to move them around every few minutes so they didn’t burn on one side. THATS IT- delicious vegetables, minimal work. Boom.